Capcom, Capcom, Capcom. I honestly do not know how to feel about you anymore. While I wasn't one of the countless Mega Man fans who had their hearts broken this week when Mega Man Legends 3 was cancelled and a Blue Bomber variation was missing from the Ultimate Marvel vs. Capcom 3 line up, some of the principles behind the latter title simply just aren't jiving with me. 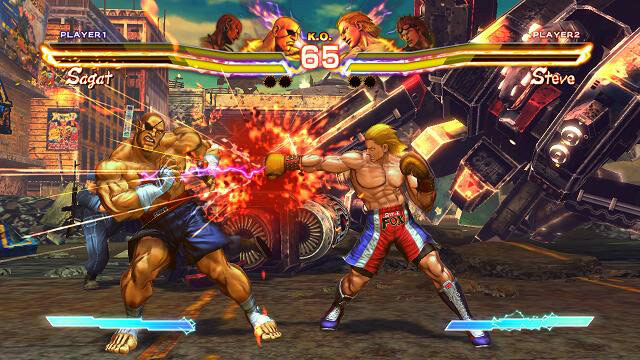 Maybe it's because I'm not super into fighting games that I feel like I spent $70 on a Marvel vs. Capcom 3 beta. To purchase a "barebones" product and be told that a better version comes out nine months later is a little disheartening. But I digress. While I'm having all these mixed emotions, Capcom made it clear that it wasn't done at this year's Comic Con. Not letting a little leak stop their train, earlier today Capcom revealed new characters for their other cross-over fighting game, Street Fighter x Tekken. 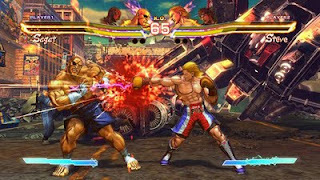 Joining the already stacked cast is Tekken Boxer Steve Fox, Street Fighter Dhalsim, Tekken Swordsman Yoshimitsu and the infamous Poison (Not to be confused with Infamous' Cole MacGrath, the PS3/PSVita exclusive character). Get the skinny on Poison, and check out Capcom's Comic Con Cinematic Trailer after the jump. Why do I say infamous? Poison originally appeared in 1990's Final Fight, a side scrolling beat em up game developed by Capcom. She was depicted as a female thug that you fought throughout the game. Things take a turn for the weird when Capcom began releasing Final Fight outside of Japan. Afraid of the backlash the game may receive from activists denouncing violent acts towards women, Poison' persona was changed for the North American release. No longer a female thug, Poison was described as an androgynous male that cross-dressed exceptionally well. A little hazy on the subject myself, a brief look around the internet revealed that a few notable Capcom figures commented on Poison's true gender. Final Fight developer Akira Nishitani noted that Poison could be male, but added it was ultimately up to the viewer to decide. Street Fighter IV producer Yoshinori Ono took the more blunt approach when he told Electronic Gaming Monthly, "Let's set the record straight: In North America, Poison is officially a post-op transsexual. But in Japan, she simply tucks her business away to look female". In retrospect this whole thing sounds really silly, and makes me think that that whole PR fiasco probably wouldn't have happened today. However, Poison still has a strong presence in the Capcom universe, appearing as a background character in titles such as Street Fighter Alpha and the more recent Marvel vs. Capcom 3. While her Final Fight appearance is the one that gets the most school yard gossip going, it's her role as a fictitious Wrestling Manager that she is most recognized for. Hugo, another Final Fight enemy, became a full fledged Street Fighter character in Street Fighter III, and for story purposes, Poison became his Wrestling Manager. But it seems that Poison will be stepping into the ring themselves as (s)he, Steve, Dhalsim and Yoshi join an already stacked cast including Street Fighters Ryu, Guile and Chun Li as well as Tekkeners Kazuya, Nina and King. As I said in the beginning of this post. Capcom, Capcom, Capcom. It seems that you have me once again in your fighting game cycle. I'm super stoked to play this game, and for some odd reason Poison was the clincher (Also the inclusion of Steve must mean that they're going to throw in a Street Fighter Boxer to go toe to toe with him. Hopefully that means my main bro Balrog will be shown down the road). Though, as with all fighting games and myself, a week or two after I'll feel inadequate because I'm terrible at fighters... plus Capcom will probably find a way to try and sell me on the product again. Yuck. Until then, the hype train continues to roll. Oh, plus I can't resist.